I love living in Singapore, as everyone knows, and have practically nothing to complain about, except for one major gripe—pedestrian etiquette. Since I do not have a car (I don’t need one plus they are horrendously expensive here), this affects me every day. There is no pedestrian etiquette in Singapore, as there is in Australia, and in case you are not familiar with the protocol, I’ll explain. Sidewalks, or footpaths as we call them in Australia, are generally wide enough for two people to pass comfortably. If you are walking two or three abreast, pedestrian etiquette requires one or two members of your party to assume a single file during a passing maneuver ie while you are overtaking or when a pedestrian is on approach from the opposite direction. This is common courtesy, and in Australia, this is observed along with the customary cheery greeting to the passer-by. In Australia, Queensland in particular, if you approach someone on the street while out walking, a hello is expected, stranger or not. In Singapore, the natural citizens ie the non-expatriates, walk two, three or four abreast and never make way for someone coming in the opposite direction. They will drive you into the terrain either side of the sidewalk or if you do decide to maintain your rightful position, striding on your fair share of the concrete, someone will walk into you rather than surrender. Similarly, they will stand in the middle of the footpath, or aisle at the supermarket, and chat away on their phones, completely oblivious or uncaring that others are trying to pass. Understanding this behavior is a conundrum. Generally, Singaporeans are non-aggressive, polite individuals, who know and understand the importance of rules and procedures, for example, proper queue etiquette. There are queues to join a queue and there are queue officials who ensure proper order and conduct is observed at all times. Queue jumpers do not survive. 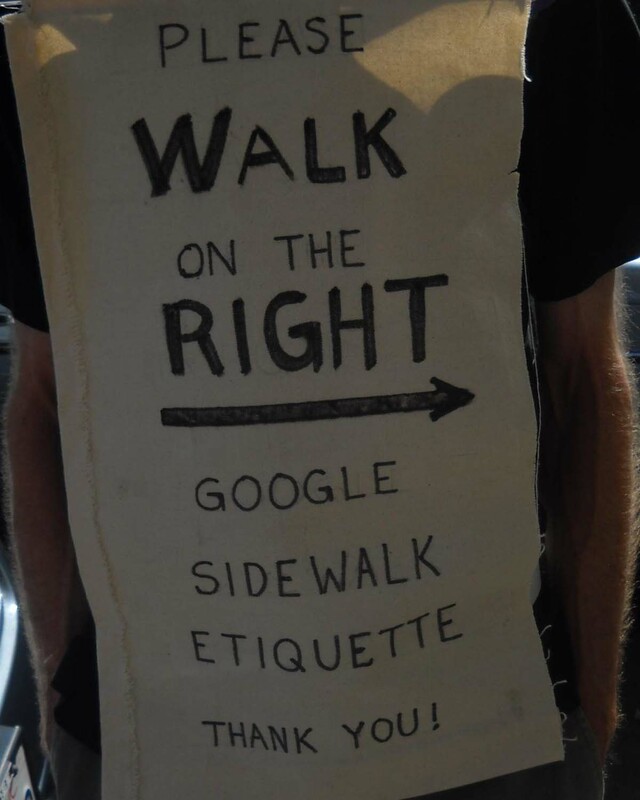 I would therefore expect Singaporeans to similarly appreciate the importance of sidewalk etiquette. If the government painted the sidewalk with a dotted line up the middle, there is a very good chance that behaviors would change since Singaporeans are conditioned to obey such ordinances, like those related to spitting, chewing gum, jaywalking etc. Is this the only solution? Must I write to the government to report this blemish on an otherwise almost-perfect society? What is the status of pedestrian etiquette in your hometown? How should one deal with poor pedestrian etiquette, in a lawful way?